Roberto Pedreira's first encounter with Muay Thai didn't impress him. "What kind of martial art is that supposed to be?" he thought. Grabbing a man's head, driving knees into his ribs, kicking his legs. It seemed more like a street brawl or Hollywood cowboy saloon donnybrook. (This was more than a decade prior to Changpuk Kiatsongrit's consciousness-raising and eye-opening visit to the USA, about which, read more below. Gracie jiu-jitsu didn't even exist in those days). But Roberto had missed the point. Muay Thai isn't a martial art (in the sense that Americans understand it). Muay Thai isn't designed to socialize children and bring spiritual enlightenment to bored housewives and identity-seeking college students. What Muay Thai is designed to be is brutally efficient at destroying adversaries. It is also eminently adaptable to the street. Eventually, Robert figured that out the first time he held a Thai pad and felt the power of a correctly executed Thai kick. It was a satori [悟り] experience. Subsequently he has never missed any chance to train Muay Thai every time he goes to Thailand (every year since 1991, 1-3 times, for 3-4 weeks at a time, see here for reports). In March 2016 Roberto once again visited at Sitpholek Gym, hoping to catch up with legend Changpuk Kiatsongrit, the man who introduced Rick Rufus and America to the painful realities of Muay Thai's leg kicks. Roberto first met Changpuk in or around the year 2000, when he (Changpuk) was teaching at Sitpholek, at that time located within the Weekender Hotel Complex. "Changpuk set off a revolution in 1988 that was less noticed, or less remembered, but as significant as the "Gracie" revolution of 1993. Changpuk introduced low kicks to American kickboxing. Rick Rufus served as the 'victim.' Basically, with nothing more than low kicks he destroyed Rick Rufus. Rick's brother Jeff comically criticized that "it doesn't take talent to kick low". Jeff missed the point. The question is not how much talent it takes, but how effective it is (which was the selling point of the Gracie revolution as well). It was a novel concept: what matters is not how difficult it is to learn or execute the technique, but how effective it is in doing what it is intended to do." (For the complete story see here). Changpuk wasn't at Sitpholek in March 2016. Back in Korea it seemed. In fact, no one was at Sitpholek, not even a girl at the counter. Roberto went in at the usual training time of 3:30 and started jumping rope, expecting that a trainer or some boxers would eventually show up. By 4:00 a boxer from Czechoslovakia arrived along with a group of four Indian pro-wrestlers and their Kurdistani teacher. A bit later two trainers, Vut and Leonaht, came down from the fourth floor where they had been watching TV or sleeping. Roberto knew Vut from years past. Leonaht was a new face, but looked somehow familiar. He stood out, being very tall for a Thai. The reason, he explained, was that his father, who he never met, had been an American serviceman based at U-Tapao airport in Rayong province, not far from Pattaya. He grew up at the Sityodtong Boxing Camp, which he joined in 1985 at the age of 11 years old. I visited Stephane Nikiema's gym and also found that no one was there. Nikiema drove by at 3:30 and also noticed that no one including his trainer was there so he unlocked the door and promised to be back soon. I went in a started jumping rope. His trainer showed up at 4:00. No one else did, except a dad and his young son. The dad watched while Nikiema taught the boy how to punch. It looked as though he had already taken some karate lessons. No one else showed up or was likely to, Nikiema explained. The new European champion, named Youssef (no doubt Youssef Boughanem) had opened up a new gym on the other side of Sukhimvit Highway and everyone went there . The young guys want to train with the champions, Nikiema said philosophically. that was normal and natural. He didn't blame them. Nikiema had given up on Pattaya and was looking for a buyer for his gym. He planned to move to New York in June where he and Jerome LeBanner were going to teach at a Crossfit gym. Nikiema also explained that Sitpholek Gym was officially closed (although he doors were still open) and the owner, Frank, had a new gym somewhere in the same general area. The lady at the Sitpholek counter (when she finally showed up) told Roberto that the new gym would be opening in several months. No one knew where anything was, other than "over there". Nikiema suggested searching the internet. That didn't help but it did tell me that there was a camp that was worth checking out. It was either new or I had somehow missed it, because it was 5-10 minutes from Sityodtong. It is the Sor Klinmee camp at 155/9 Moo 6 in Nongphrue . I will check out both camps next time. Leonaht, still in good shape at 42 years of age. Poster of Leonaht with championship belt. Leonaht (on right) in 1990 . Indian Pro-Wrestlers and Kurdistani Teacher. 3. 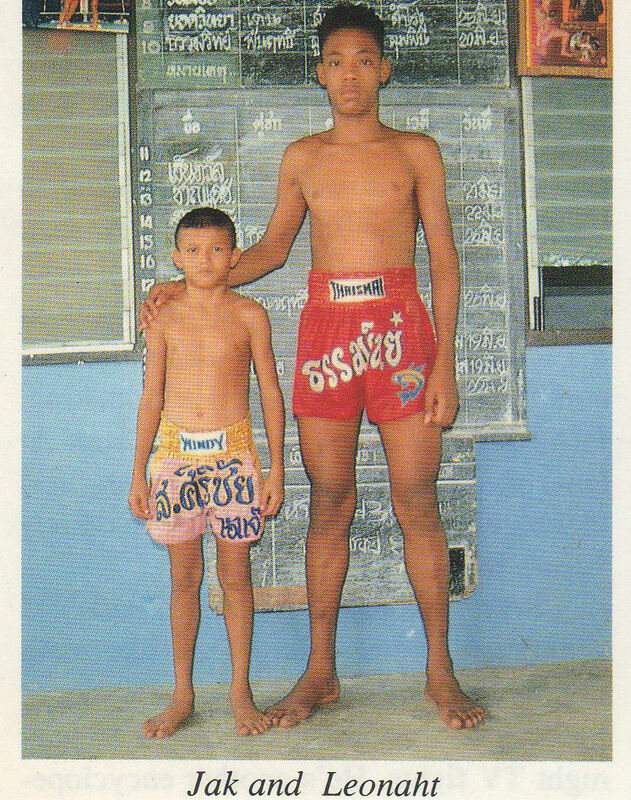 Photo from "The Camp where Champs are Made" by Gary Ohmert, in Muay Thai Volume 1 (1990), p. 75.